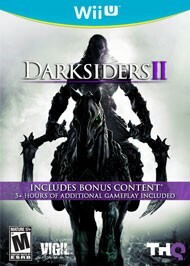 I check out a full dungeon in Darksiders II and see what sets Death apart from his brother, War. "What makes Death different from War is almost everything about him," says Darksiders II's director, Marvin Donald. Fortunately, Donald and the rest of the team spend the rest of this video being significantly less cryptic. THQ and Vigil Games have released an extended cut of Darksiders II's announce trailer, featuring a few additional shots of the new horseman in action.